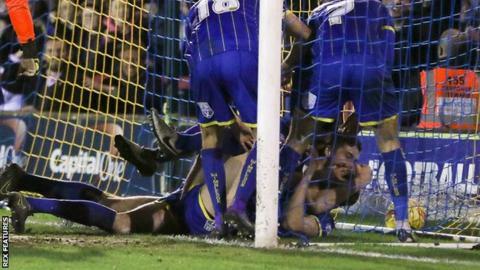 AFC Wimbledon moved into the play-off places as Paul Robinson bundled in a second-half header against Carlisle. Carlisle had goalkeeper Mark Gillespie sent off five minutes after the break when he brought down Tom Elliot on the edge of the penalty area. Robinson pounced from the resulting free-kick after substitute Dan Hanford had parried Lyle Taylor's effort. Carlisle captain Michael Raynes almost equalised seven minutes from time but crashed a half-volley onto the post. "I think it's easy when the opposition go down to 10 men for you to think that we should dominate the game and pass it. "The pitch wouldn't allow anyone to control the game out there and neither would Carlisle." "It was tough and I thought they were excellent." "For us to manage to win that game says a lot about our players and they deserve a lot of credit." Match ends, AFC Wimbledon 1, Carlisle United 0. Second Half ends, AFC Wimbledon 1, Carlisle United 0. Corner, AFC Wimbledon. Conceded by Mark Ellis. Attempt saved. Jabo Ibehre (Carlisle United) right footed shot from outside the box is saved in the centre of the goal. Attempt saved. Jabo Ibehre (Carlisle United) right footed shot from the right side of the box is saved in the centre of the goal. Foul by Adebayo Akinfenwa (AFC Wimbledon). Substitution, AFC Wimbledon. Dannie Bulman replaces George Francomb. Substitution, Carlisle United. Troy Archibald-Henville replaces Brandon Comley. Corner, Carlisle United. Conceded by Barry Fuller. Michael Raynes (Carlisle United) hits the left post with a header from the centre of the box. Brandon Comley (Carlisle United) wins a free kick in the attacking half. Attempt saved. Brandon Comley (Carlisle United) right footed shot from outside the box is saved in the centre of the goal. Foul by Andy Barcham (AFC Wimbledon). Derek Asamoah (Carlisle United) wins a free kick in the defensive half. Brandon Comley (Carlisle United) is shown the yellow card for a bad foul. George Francomb (AFC Wimbledon) wins a free kick in the attacking half. Foul by Brandon Comley (Carlisle United). Substitution, Carlisle United. Derek Asamoah replaces Alex McQueen. Corner, Carlisle United. Conceded by Connor Smith. Attempt saved. Hallam Hope (Carlisle United) header from the left side of the box is saved in the centre of the goal. Attempt missed. Lyle Taylor (AFC Wimbledon) right footed shot from the centre of the box is close, but misses to the left. Tom Elliott (AFC Wimbledon) wins a free kick in the defensive half. Foul by Michael Raynes (Carlisle United). Corner, Carlisle United. Conceded by Jonathan Meades. Michael Raynes (Carlisle United) wins a free kick in the attacking half. Jonathan Meades (AFC Wimbledon) wins a free kick in the defensive half. Foul by Jake Reeves (AFC Wimbledon). Corner, Carlisle United. Conceded by Ryan Sweeney. Goal! AFC Wimbledon 1, Carlisle United 0. Paul Robinson (AFC Wimbledon) right footed shot from very close range to the centre of the goal following a set piece situation.